Please note the QuoTrek Companion Streamer is being updated tomorrow evening (October 20, 2011). The existing version will be replaced with the new and enhanced QuoTrek companion streamer, which is available to all existing QuoTrek standalone users. The first time you log into the new QuoTrek companion streamer, your symbols from the old version will be copied over. This is a one-time copy. After the initial login, if you make changes to the old QuoTrek companion streamer, the symbols will not automatically be copied. You should only make changes to the new QuoTrek companion streamer going forward. The new Shared Symbol List feature gives you the ability view and update your QuoTrek symbols within the QuoTrek companion streamer. 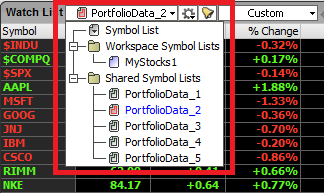 You will see your Shared Symbol Lists from the Watch List pull-down menu. The Watch List is the window you can use to create and access your 5 QuoTrek symbol lists. Click here for more information on Shared Symbol Lists. If you have any questions or need additional assistance, feel free to contact us.